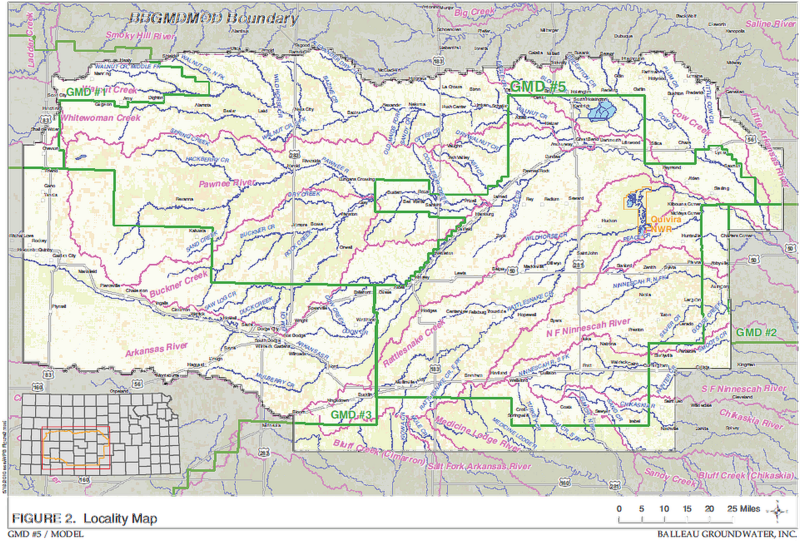 The district-wide modeling effort started following the Pawnee River basin water accounting report by Balleau Groundwater Inc. ("BGW"). The District Board quickly realized that it needed a comprehensive, scientific tool to evaluate alternative groundwater management scenarios for the District area. Clarify the relationship between alternative management actions and the resultant hydrologic conditions to the aquifer and streams. Provide a tool capable of addressing questions of watershed management, aquifer sustainability, source-water accounting and conditions of the aquifer and streams. S.S. Papadopulos & Associates, Inc. ("SSPA") provided technical expertise throughout the model development and provided an independent peer review on behalf of Kansas Department of Agriculture - Division of Water Resources. SSPA had been involved in the development of various prior modeling efforts with the Kansas Geological Survey on the Middle Arkansas River Subbasin. Following model development, SSPA generated a peer review report for KDA-DWR. In June 2010, BGW finalized the model report describing the model (BBGMDMOD) and its respective characteristics. Access to the model report, appendices and peer report can be found in the Model Access section. In the years since development, the District, state agencies and private entities have used the BBGMDMOD to evaluate several management actions to the region including the Quivira NWR impairment investigation, Cities of Hays & Russell change applications, and many more. The District shall require a written request for access to any hydrologic report generated by the District’s groundwater model (BBGMDMOD, 2010). All written requests shall include the name and address of the requestor and a description of the intended use for the report. A fee of $45.00 per copy will be charged. A fee of $35.00 per hour ($20.00 minimum) custodial time will be charged for time spent to supervise and produce the report. Prepayment is required. Every request for model scenario shall be submitted to the District board of directors for approval by formal action. The option to utilize District funds to pay for all or part of the proposed model run and corresponding analysis shall be at the discretion of the board of directors at the time of approval. The District retains the intellectual property rights for any information obtained from any model run and corresponding report(s) made using the District’s groundwater model. Only eligible voters of the District as defined by K.S.A. 82a-1021, shall be allowed to submit model run requests to the District board of directors.